Hibs have sold out their allocation for the next Edinburgh derby against Hearts, with 3,600 Hibees set to cheer on their team at Tynecastle. The Easter Road side put tickets for the April 6 clash on sale from midday on March 22 and by around 2pm, they had all been snapped up. Hibs fans are given the whole of the Roseburn Stand for derby matches at the home of their rivals. Paul Heckingbottom is seeking a sixth league game unbeaten since taking charge of the Hibees after leading his side to victories over Hamilton, St Johnstone, Motherwell and Dundee and a 1-1 draw with Rangers. Hibs haven’t won in Gorgie since May 2013, when a last-minute Ross Caldwell winner sealed victory. 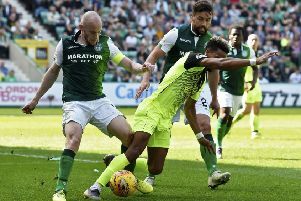 The Capital rivals have met twice so far this term, with the first match at Tynecastle ending in a goalless draw and Hearts winning the return match at Easter Road in late December.